The standard method for XRD in geology is wide area powder scanning with Bragg-Brentano geometry. An alternative method is XRD microanalysis, which enables you to scan smaller spots in-situ, without grinding the rock. This reveals information that can be missed by bulk scanning. Blue Scientific is the official Nordic distributor for Bruker XRD in the Nordic region (Denmark, Norway, Sweden, Finland, Iceland). For more information or quotes, please get in touch. Join us in Uppsala on 12-13 June for talks from invited speakers, discussions and networking with the Nordic XRD community. XRD (X-Ray Diffraction) is often used in geology for qualitative and quantitative mineralogy. Trace mineral phases are revealed that can’t be identified with traditional powder methods alone. This is possible by rotating the sample in a pseudo-Gandolfi mode (phi rotation and psi oscillation). The lazulite sample is from the Carolina Slate Belt in Georgia, where low- to medium-grade meta-volcanics were mined for kyanite for high-alumina refractory products. This area is also renowned among mineral collectors for high quality twinned rutile crystals, iridescent hematite coatings on quartz, lazulite, pyrite and pyrophyllite. This example is available to download in an application note from Bruker. With the EIGER2 detector, you can switch easily between 1D and 2D geometry. 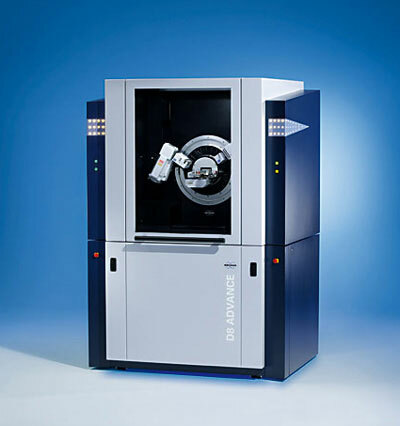 This means you can collect both traditional powder scans and micro-diffraction data. Lazulite sample: Bragg-Brentano data was collected from the green box. 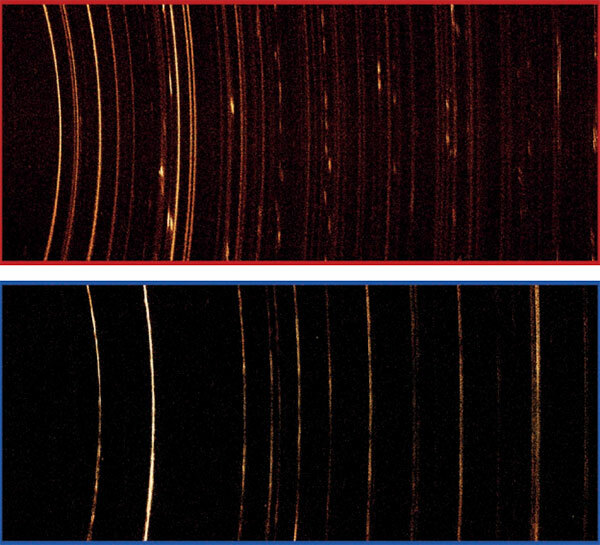 The red and blue spots were analysed using microdiffraction. Bragg-Brentano geometry is traditionally used for mineralogical specimens. A wide area scan was collected from the green box in the image above using a line beam and scanning 1D detector mode. The specimen was rotated in phi during the measurement. The diffraction pattern is dominated by quartz from the matrix (shown below). Trace amounts of variscite and pyrite were also identified. However, the phases associated with lazulite are absent, despite visual confirmation. Bragg-Brentano works well for powders, but fine details can become lost in noise or even missed completely, like in this example. Wide area scan in Bragg Brentano geometry: The illuminated area is large, so the diffraction signal is dominated by the matrix, primarily quartz. Trace amounts of variscite and pyrite are identified. In the 2D measurement, the lazulite crystal and quartzite matrix were measured in-situ using a 0.5 mm spot beam and the EIGER2 in scanning 2D mode. During the measurement the specimen was rotated in phi at 3 rpm and oscillated in psi from 0˚ to 35˚ (pseudo-Gandolfi) to provide more reflections. Micro-diffraction confirms that the matrix is primarily fine-grained quartz. Data from the large lazulite crystal shows intergrowths of polycrystalline variscite, metavariscite and gypsum. 2D micro-diffraction of lazulite porphyroblast (top in red) and quartzite matrix (bottom in blue). The spots in the lazulite phase indicates a large single crystal, with smooth diffraction rings typical of fine-grained intergrowths. Microdiffraction data: The matrix (blue) is shown as predominantly quartz, while the lazulite inclusion (red) has multiple mineral phases.